Dr. Smolderen is an Assistant Professor in Implementation Science at the Department of Biomedical & Health Informatics. She is a PhD medical psychologist by training. Over the past years, she has published over 40 peer-reviewed manuscripts, including a report on the association between different types of depressive symptom clusters with myocardial infarction outcomes that won 1st Place in the QCOR Young Investigator Award in 2009 of the American Heart Association. She also published work on disparities related to the lack of health insurance, underinsurance, and cardiac care in JAMA while completing her post-doctoral fellowship in outcomes research through the American Heart Association in 2010. 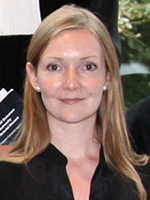 Her research focuses on the identification of subpopulations at-risk of suboptimal health outcomes in cardiovascular populations, with a focus upon patients with peripheral arterial disease (PAD). Towards that end, she pursues a broader conceptual model of risk, including patients’ psychological and socio-economic status. She has been supported by a prestigious Dutch career development award, and is the PI on 2 PCORI projects. With this work, she has established a solid research infrastructure with which she documents the shortcomings in the way care for PAD is organized and how that impacts clinical and patient-centered outcomes – a hitherto understudied area of growing importance to clinicians and policy makers.